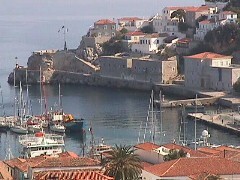 Hydra is perhaps the most beautiful port village in all of Greece. A tiny harbour ringed with cafés, restaurants and gold shops is surrounded by a village of stone houses and villas that rise up the hills like an amphitheatre. But one of the best things about Hydra is that there are no cars. Everything is moved by donkey, including groceries, building supplies, people and their luggage. Hydra is the former home of Leonard Cohen and stomping grounds of Mick Jagger, Keith Richards, Pink Floyd and many other famous and not so famous people. Is a little expensive island, but not as much as Mykonos or Santorini and there are still bargains to be found on the back streets in the way of food, hotels and entertainment Sandy beaches is the weak point of the island as they simply don't exist with the exception of Madraki bay. Swimming in Hydra -in the rather clear and deep waters- can be done only rock diving and that is what everybody, locals and tourists, does.